A preview of the second game in the NCAA Tournament, as the Shockers of Wichita State take on the Commodores of Vanderbilt at 9:10pm EST on truTV. In the second game of the evening and also the second game in the 2016 NCAA Tournament overall, the Wichita State Shockers will take on the Vanderbilt Commodores in this battle of 11 seeds. The game is Tuesday night, March 15th and tip-off time is expected to be at 9:10pm EST. That time could be pushed back, depending on how long the game beforehand between Fairleigh Dickinson and Florida Gulf Coast goes. The Shockers are 24-8 (17-3 conference) on the season and the Commodores are 19-13 (11-9 conference). This is Wichita State’s fifth straight trip to the NCAA Tournament while this Vanderbilt’s first trip to the big dance since 2012. 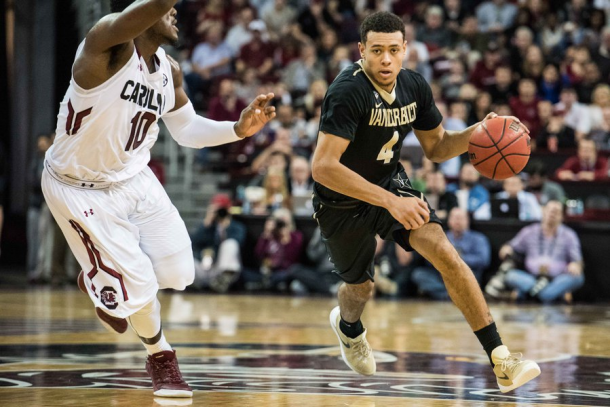 Vanderbilt has two players averaging 14 points per game in guard Wade Baldwin IV and center Damian Jones. Baldwin is also able to dish the ball around, as he averages 5.2 assists per game. Meanwhile Jones does what a big man does, he pulls down rebounds. He averages nearly seven rebounds a game. The Commodores also have two other players that nearly average double digits in points. Those players are guard Matthew Fisher-Davis (9.9) and forward Jeff Roberson (9.5). Vandy has scoring potential but they are matching up against the NCAA’s top defense in Wichita State. The Shockers only allow 59.3 PPG to opponents (best in the nation) and are the top defense in the country according to KenPom rankings. On the offensive side of the ball, the Shockers have a multitude of players they can look to. Ron Baker (14.2 PPG) and Fred VanVleet (12.0 PPG) are the primary go to players on offense, but they are by no means the only offense the Shockers have. Forward Anton Grady is a key six man for the team, and can do just about everything. He is a big man at 6’8” 230 lbs. but he can shoot the ball outside, drive to the hoop, and post up defenders. Wichita State has plenty of depth and doesn’t always have to rely on its starters to get the job done. Their bench players are very adequate. The Shockers aren’t the most potent offensive team but like aforementioned, their defense is tremendous and very dangerous. For the first half, expect a close game. Wichita State’s offense is typically slow and incompetent in the first half, which allows opponents to hang around. But the Shockers defense will be able to do a decent job of shutting Vanderbilt down. Expect a low scoring half from both teams. Then for about the first eight-ten minutes of the second half, it should again be a close game. But Wichita State guard Ron Baker is notorious for scoring big in the second half. Unless the Shockers run into foul trouble, expect more hard and aggressive defense as well. The Shockers will likely pull away late to win the game. Vandy can win this game, but they are not particularly great on the defensive side and would have to step it up. The Commodores would have to shoot incredibly well to win this game, which is something they can do. But because of proven experience and winning at this point in the season, Wichita State has the edge. The winner moves on to play six seed Arizona Wildcats on Thursday.